Samsung Q1 is an Ultra Mobile PC (UMPC) with a 7″ WGA LCD screen which is the first produced and marketed ultra portable mobile computer under Microsoft Oragami project. 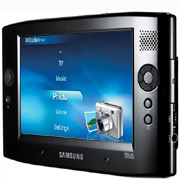 Samsung Q1 UMPC is a small form factor tablet PC which runs on Windows XP Tablet PC Edition 2005 operating system. Samsung Q is powered by 900Mhz Intel Celeron processor, features 40 GB hard drive, Bluetooth connection, and weighs 0.78kg plus DMB support. Other than BostonHerald, more reviewers has reviewed Samsung Q1. TabletPCReviewSpot (dead link) reviews Samsung Q1 and concludes that the Samsung Q1 is a first of the very first generation of the Ultra Mobile PC devices. That said, we can surely expect improvements in future models. The Q1 is a perfect device for specific users who need to stay connected and productive on the go. Our advice is simply this: Do not expect the Q1 to be a “replacement” for a real Tablet PC or notebook computer. The Q1 and UMPC devices in general are an excellent alternative to users who wish to have much more functionality than they can get from a PDA, but to avoid carrying an entire Tablet PC or notebook computer everywhere. If this describes “you”, the Q1 is certainly worth your consideration. ComputerAct!ve (dead link) rates Samsung Q1 as 3 out of 5 and concludes that the Q1 is undeniably an evolution in mobile computing but it’s hard to see how far spread its appeal will be, with good points as small, lightweight and versatile. Bad points however are poor battery life, small hard disk and not a powerful computer. UltraMobilePCs (dead link) has a first impression review on Samsung Q1 and concludes that if the idea of having a full fledged computer, a Tablet PC, Media center capabilities and an internet device that can go anywhere you do….then the $1099.00 price tag on the Q1 is a small price to pay for having it all in a 1.7 pound package. TrustedReviews gives Q1 overall rating of 7 out of 10 and writes that it’s top marks to Samsung for creating a beautifully designed and constructed ultra mobile PC. The Q1 really does look the part and in many ways it has the ability to back up its stylish appearance. The inclusion of the USB keyboard travel pack is more of an obvious necessity than a good idea, making the Q1 a usable mobile computer. General browsing and even watching video is a joy on this little machine, but you really want to do these things on the move, without being tethered to a power socket. RegHardware concludes that like the first-generation iPod, Samsung’s Q1 is an expensive bragging tool. Unlike Apple’s gadget, the UMPC simply isn’t ready for primetime, even if the price comes down. Samsung’s design isn’t bad but there are few hardware issues and the software needs some work. It’ll get there eventually, though look how long it took Microsoft to get PocketPC/Windows Mobile right. For now, though, only early adopters need apply. PC Magazine gives fair editor’s rating of 2.5 out of 5 and concludes that it’s just another slate tablet that can’t replace a true PC, but it makes for a nice portable media player that would be more attractive if it weren’t so pricey. Good points are good speaker sound quality, has full-blown Windows XP operating system, very portable and has resolution toggle button, while bad points are no keyboard (has since shipped with keyboard) or optical drive included, not very good for writing extensively, has PDA-like stylus, slow processor and nonupgradable RAM. CNet meanwhile gives mediocre editors’ rating of 4.9 out of 10 and concludes that “the Samsung Q1’s sleek case is definitely eye-catching, but we expect better performance and battery life for a thousand of our hard-earned bucks.” The good points are it’s beautiful, featherweight design, has decent-size screen, multiple methods to navigate menus and input text, plenty of networking options and dual-mic array. The bads are lacks keyboard (has since shipped with keyboard), poor performance, short battery life and weak speaker sound. Consumer Electronics Net (dead link) writes that the Samsung Q1 feels like an engineering exercise ordered by someone who couldn’t bring himself to abandon the idea of a tablet PC. This is not an improvement on the tablet PC, which has shown itself to be of limited usefulness except in certain niche markets such as hospitals. Adding a touchpad and a slide-out keyboard would go a long way toward solving the awkwardness of its user interface, and perhaps modifying Windows XP Tablet Edition would also help its usability. As it stands now, the Samsung Q1 is a failure. Even if it cost $500 — as the original Origami specification planned — it would still stand as a fine multimedia player that can’t do anything else very well. Not recommended. 3.5 out of 10 stars. PC Pro gives rating of 4 out of possible 6 and writes that much kudos to Samsung for actually producing a device so soon after launch, although the control system does need a little work. It isn’t overly expensive though, and if you can appreciate the product for what it is – a well-built and attractive ultraportable tablet – then it may be your perfect mobile partner. IT Reviews concludes that Samsung’s Q1 is unavoidably likeable, with its big screen and all round novelty value. But it is more expensive than many laptop computers, and doesn’t really offer enough that is exciting to justify the price-tag. Samsung has decided to include its Travel Pack for the Q1 with the device at no extra charge, which includes a keyboard. Washington Post concludes that and it costs $1,100, more than many heavier laptops and not that much less than ultra light models that only weigh a pound or so more than this crippled contraption. There will be other manufacturers selling Ultra-Mobile PCs, some of which could include such interesting additions as Global Positioning System capabilities and (here’s a crazy idea) a keyboard. If they sell for anything close to Samsung Q1’s price, any potential the Ultra-Mobile concept might have will continue to be Utterly Missed.